At our first meeting after the EU referendum, our Inner Transition organising group decided to host a public listening event. We felt the referendum and its aftermath had been incredibly divisive, revealing deep fault lines in our communities and homes, and we wanted to bring people together in an informal context to speak and be listened to. We decided to organise a series of conversations in a short space of time, in the model of speed dating. 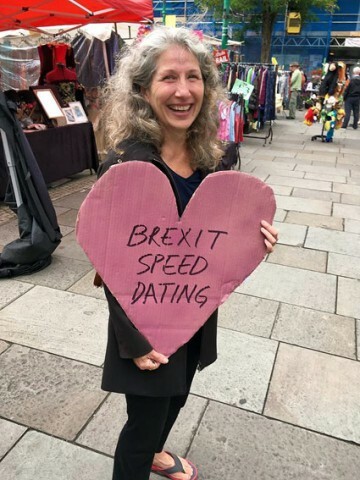 We put the word out that we were hosting a BREXIT SPEED DATING Br-Listening Project in our market square, to be held in the daytime with the market in full swing. Our plan was to reach out to people from a wide range of backgrounds, beyond the people who usually come to our Transition events. On the day of the event, we brought banners, signs and chairs, and found a corner of the market in which to set up. We had pre-prepared cards with instructions on how to listen, with four questions for each pair of people to address in turn. We deliberately did not ask people to declare their views or allegiances, in order to foster connection rather than division. We had timers available, with a suggestion time of up to two minutes per answer. We were still setting up when people started arriving, and our event took off effortlessly. For the three hours during which it ran, we had an average of four couples participating at any one time. Our organising group helped pair people up and guide them into the process; held a safe space and attended to people's needs; and listened to those how wanted more time to be heard. We also canvassed people on the street to come and join the discussions. I spent most of the time at the front of the market, inviting people to join us, and had countless short conversations and encounters. I made a point of approaching people across different demographics, backgrounds and ages. Our “BREXIT SPEED DATING” sign certainly got people's attention, though it was also confusing for many. A lot of people thought we were holding a dating event, and said things like, “I'm already married.” However, most people, once drawn in, were then open to hearing about our project. Many people spoke about their feelings, naming amongst others despair, anger, grief, depression, resolution and overwhelm. In a town which had overall voted to Remain, we found more Remainers wanting to have a longer conversation. A number of people who voted for Brexit told me their views without wanting to engage further, and I wondered if they felt they would have been attacked (I showed them our questions when possible). There were many touching moments, including hearing from the woman who had researched and researched, in order to make an informed choice; when she got to the voting booth she found she couldn't vote because she still didn't know what was the right thing to do. For me, the whole project was worthwhile for the man who said, “My opinion doesn't matter, no-one listens to me. I'd love to join in”. People appreciated the opportunity to talk and be heard. People found it opened their minds to stop and listen to someone else's point of view. It is possible to engage people on a controversial topic in a way that fosters connection rather than division. We tapped into a yearning for deep listening and authentic communication. Another time we might think of a less confusing title. This conversation is longing to be continued. We might move this process indoors, with less distraction and more context.